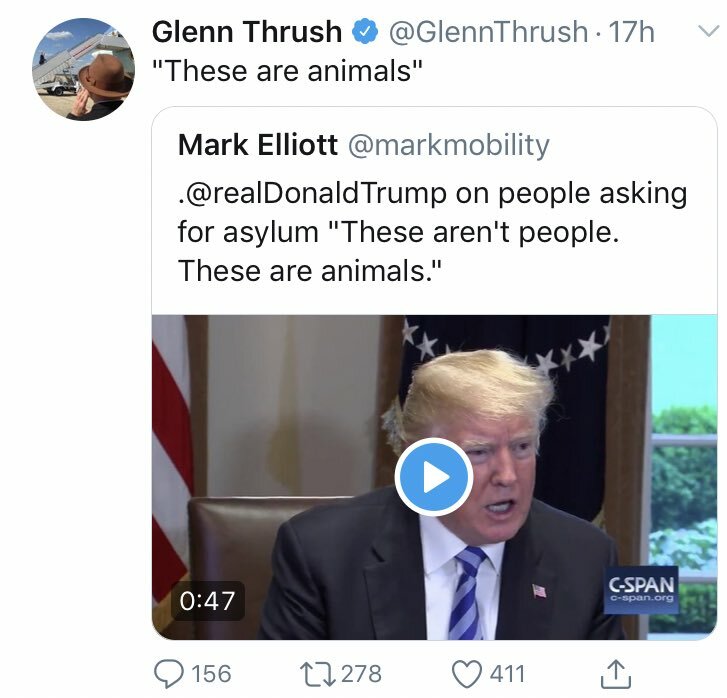 An unverified Twitter user going by the name Mark Elliot has deleted a tweet that caught fire on liberal Twitter, purporting to show that Donald Trump called asylees "animals." 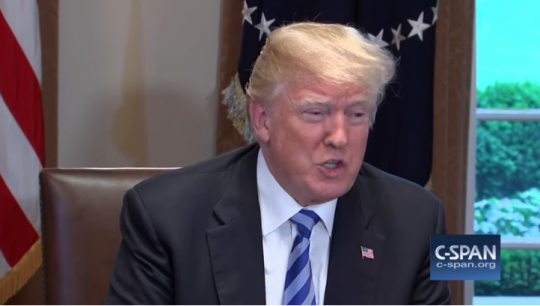 As he admitted after leaving up the viral tweet for three days, the clip was from a year ago and cut off context that made it clear Trump was asked specifically about the violent gang MS-13. When Trump's comments first made waves, it sparked a wave of blatantly misleading tweets and stories that omitted the MS-13 context to say Trump made the comments about "immigrants" or "illegal immigrants." The lame and tenuous arguments for that framing are moot this time around. It's just waaay too much of a leap in logic to take comments about illegal immigration generally and MS-13 specifically, and frame them as specifically about a different, sympathetic subset of legal and illegal immigrants. You didn't need a photographic memory or an encyclopedic knowledge of Trump quotes to realize the video was a rehash, just to follow politics and remember controversies that dominated headlines. That seems like a low bar, but it was a bar that dozens of major political figures failed to hurdle. I honestly can't quote or embed every major Democrat or media figure who fell for this tweet, because this piece would go on for several pages. Instead I'll hyperlink and list them out in a run-on sentence: Presidential candidates Kirsten Gillibrand, Beto O'Rourke, and Pete Buttigieg, Representatives Ilhan Omar, TJ Cox, Crissy Houlahan, Jimmy Gomez, Frank Pallone, and Yvette Clark, DNC chairman Tom Perez, Pennsylvania AG Josh Shapiro, the Delaware Democratic Party, The New York Times‘ Jamelle Bouie and Glenn Thrush, former Obama staffers Ben Rhodes and Jake Maccoby, CNN's Christopher Cuomo and Ana Navarro, ThinkProgress' Josh Marshall, gun control activist David Hogg, disgraced journalist Dan Rather, MSNBC's Joy Reid or maybe her hacker, and the NAACP's Sherrilyn Ifill. That's excluding celebrities like Jose Andres, John Cusack and Chrissy Teigen who cosplay as political commentators, or people like Mikel Jollet , Tony Posnanski, Qasim Rashid, and Brian Klass whose actual jobs I cannot begin to fathom, but are popular lefty Twitter stars with hundreds of thousands of followers. One of the most popular quotetweets of the false tweet—getting a whopping 44,000 retweets—was sent by a Jesuit priest. I've archived all the above tweets for posterity, but as of this writing virtually all of them are still up (Glenn Thrush's is the only exception). A few of the pundits issued "clarification" tweets while leaving the original tweets up to continue racking up those sweet, sweet likes and retweets. This is not great! This is a loooot of people who you would think shouldn't be spreading lies, but are! Ignorance was barely an excuse to begin with, but that flew out the window when all these people keep spreading the falsehood after others pointed out the error. I really, really shouldn't have to spell out why this is scandalous, but the media reaction has been nearly nonexistent outside of coverage in conservative outlets. Business Insider has a piece debunking the initial tweet, but as of this writing I couldn't find any other stories on the false trend. A TVEyes search didn't find anyone on MSNBC or CNN debunking the claim … although it did find that the Center for American Progress' Neera Tanden, the Daily Beast's Jonathan Alter, former DNC CEO Jess O'Connell and CNN's Jim Sciutto spread the claim on their airwaves without correction. It's difficult to imagine several Republican presidential candidates spreading a false claim from an unverified account, failing to delete it for several days, failing to apologize or clarify their remarks, and the media just sleeping on the story. Throw in dozens of conservative pundits, congressmen, the RNC chairman, Fox News, and you've got a multi-day narrative on your hands. At the very least you'd see a Glenn Kessler hit or a half-paragraph from Brian Stelter. I guess I don't actually blame the media for ignoring a story that's embarrassed a lot of their own colleagues and plays into the narrative of their favorite punching bag. But for cripes sake, holding the powerful accountable is your job. You don't get to pick and choose when to do that just because the lie was about a politician you don't like. This entry was posted in Politics and tagged Donald Trump, Illegal Immigration, MS-13. Bookmark the permalink.